In 1770, Hungarian engineer Wolfgang von Kempelen unveiled a miracle: a mechanical man who could play chess against human challengers. 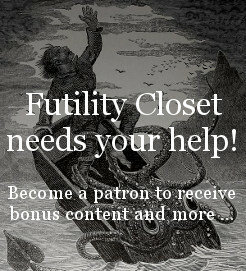 In this week’s episode of the Futility Closet podcast we’ll meet Kempelen’s Mechanical Turk, which mystified audiences in Europe and the United States for more than 60 years. We’ll also sit down with Paul Erdős and puzzle over a useful amateur. Lewis Carroll sent a birthday wish list to child friend Jessie Sinclair in 1878. An octopus named Paul picked the winners of all seven of Germany’s World Cup games in 2010. Tom Standage, The Turk, 2002. Elizabeth Bridges, “Maria Theresa, ‘The Turk,’ and Habsburg Nostalgia,” Journal of Austrian Studies 47:2 (Summer 2014), 17-36. Stephen P. Rice, “Making Way for the Machine: Maelzel’s Automaton Chess-Player and Antebellum American Culture,” Proceedings of the Massachusetts Historical Society, Third Series, 106 (1994), 1-16. 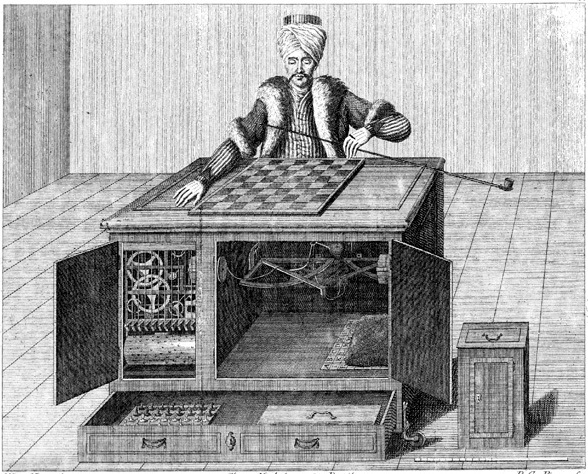 Dan Campbell, “‘Echec’: The Deutsches Museum Reconstructs the Chess-Playing Turk,” Events and Sightings, IEEE Annals of the History of Computing 26:2 (April-June 2004), 84-85. John F. Ohl and Joseph Earl Arrington, “John Maelzel, Master Showman of Automata and Panoramas,” Pennsylvania Magazine of History and Biography 84:1 (January 1960), 56-92. James W. Cook Jr., “From the Age of Reason to the Age of Barnum: The Great Automaton Chess-Player and the Emergence of Victorian Cultural Illusionism,” Winterthur Portfolio 30:4 (Winter 1995), 231-257. W.K. Wimsatt Jr., “Poe and the Chess Automaton,” American Literature 11:2 (May 1939), 138-151. Peggy Aldrich Kidwell, “Playing Checkers With Machines — From Ajeeb to Chinook,” Information & Culture 50:4 (2015), 578-587. Brian P. Bloomfield and Theo Vurdubakis, “IBM’s Chess Players: On AI and Its Supplements,” Information Society 24 (2008), 69-82. Nathan Ensmenger, “Is Chess the Drosophila of Artificial Intelligence? A Social History of an Algorithm,” Social Studies of Science 42:1 (February 2012), 5-30. Martin Kemp, “A Mechanical Mind,” Nature 421:6920 (Jan. 16, 2003), 214. Marco Ernandes, “Artificial Intelligence & Games: Should Computational Psychology Be Revalued?” Topoi 24:2 (September 2005), 229–242. Brian P. Bloomfield and Theo Vurdubakis, “The Revenge of the Object? On Artificial Intelligence as a Cultural Enterprise,” Social Analysis 41:1 (March 1997), 29-45. Mark Sussman, “Performing the Intelligent Machine: Deception and Enchantment in the Life of the Automaton Chess Player,” TDR 43:3 (Autumn 1999), 81-96. James Berkley, “Post-Human Mimesis and the Debunked Machine: Reading Environmental Appropriation in Poe’s ‘Maelzel’s Chess-Player’ and ‘The Man That Was Used Up,'” Comparative Literature Studies 41:3 (2004), 356-376. Kat Eschner, “Debunking the Mechanical Turk Helped Set Edgar Allan Poe on the Path to Mystery Writing,” Smithsonian.com, July 20, 2017. Lincoln Michel, “The Grandmaster Hoax,” Paris Review, March 28, 2012. Adam Gopnik, “A Point of View: Chess and 18th Century Artificial Intelligence,” BBC News, March 22, 2013. Ella Morton, “The Mechanical Chess Player That Unsettled the World,” Slate, Aug. 20, 2015. “The Automaton Chess Player,” Scientific American 48:7 (February 17, 1883), 103-104. Robert Willis, An Attempt to Analyse the Automaton Chess Player, of Mr. de Kempelen, 1821. “The Automaton Chess-Player,” Cornhill Magazine 5:27 (September 1885), 299-306. Edgar Allan Poe, “Maelzel’s Chess-Player,” Southern Literary Messenger, April 1836, 318-326. You can play through six of the Turk’s games on Chessgames.com. Nicholas Gibbs, “Voynich Manuscript: The Solution,” Times Literary Supplement, Sept. 5, 2017. Annalee Newitz, “The Mysterious Voynich Manuscript Has Finally Been Decoded,” Ars Technica, Sept. 8, 2017. Natasha Frost, “The World’s Most Mysterious Medieval Manuscript May No Longer Be a Mystery,” Atlas Obscura, Sept. 8, 2017. Sarah Zhang, “Has a Mysterious Medieval Code Really Been Solved?” Atlantic, Sept. 10, 2017. Annalee Newitz, “So Much for That Voynich Manuscript ‘Solution,'” Ars Technica, Sept. 10, 2017. “Imaginary Erdős Number,” Numberphile, Nov. 26, 2014. Oleg Pikhurko, “Erdős Lap Number,” Mathematics Institute, University of Warwick (accessed Sept. 15, 2017). This week’s lateral thinking puzzle was contributed by listener Alex Baumans, who sent this corroborating link (warning — this spoils the puzzle).